The working culture in South Korea is similar to the working culture in Japan. The South Korean office workers stay overtime until late at night daily. They don't practice flexible working hours or working for 8-9 hours as written in the employment contract. South Korea has one of the highest average workweeks and overtime hours in the world. With their rigorous work ethic, you are expected to be highly committed and go beyond of your own standards in order to keep up with the rest of your colleagues. When they commit more time and effort on their work, they don't have extra time to shop for their necessities. Therefore, Homeplus (a retail chain store which is owned by Samsung and Tesco in South Korea) executed a brilliant idea to help them to shop at the subway stations. You can read the news as below. In South Korea, only the wealthy people can afford to buy vehicles while many of the locals depend on the public transportation such as buses and subways. Taxi (cab) is very costly to ride in South Korea. During the day, the basic rate for the taxi is 2,400 won (US$2.26) for the first two kilometers and 100 won (US$0.09) for every 144 meters thereafter. If the taxi is traveling at a speed lower than 15 kilometers per hour, 100 won (US$0.09) is added to the meter every 35 seconds. A friend went on his business trip to South Korea for the first time and shocked to experience their working culture in the company. He had to join his Korean colleagues to work and sleep in the office for the straight 5 days and was able to return to his hotel on weekends. It went on until the end of his business trip there. I also asked my Korean friends about the working culture there. They agreed that they stayed overtime in the office until late at night frequently. When we invited them to visit San Francisco, they wished to travel but they had difficulty to apply for long vacation from the companies. There are many news surfaced recently that the Korean celebrities and pop stars involve in car accidents because they are over exhausted without proper rests due to their hectic schedules. Even, the popular actress, Han Ye Seul also suffered from poor working conditions with her ongoing drama series, Myung Wol the spy. She slept for one to two hours for several weeks due to overtime shooting which in the end, she couldn't take it anymore hence, she went missing for a few days before returning for production. Homeplus, the nation’s second largest discount chain, announced yesterday that it will open what it calls a “fourth generation retail store,” Homeplus Smart Virtual Store, at Seolleung subway station in southern Seoul today. It says it’s the first of its kind in the world. At a press conference yesterday before the official launch, Homeplus CEO Lee Seung-han said discount store chains must respond to rapidly changing consumer habits and behavior, and a new kind of virtual store will cater to skyrocketing smartphone users in Korea. “Consumers will be able to order and get delivery of 35,000 products, ranging from milk, egg, pasta sauce, gochujang [Korean red pepper paste], tissues and digital cameras, by simply pulling out their smartphones and scanning QR [Quick Response] or barcodes of products shown in the subway station with the Homeplus app,” Lee said. In fact, consumers don’t have to be anywhere near the virtual store. “For example, if you want to order replacements of a bottle of water that you have in your hand, you don’t have to stop by the subway station,” Lee said. “You simply scan the bottle’s barcode with the Homeplus app.” The products are delivered later to home or office. Homeplus explained it chose Seolleung station for its trial store because over 200,000 commuters use it every day. While Android smartphone users will be able to use the service starting today, the Homeplus app won’t be available at the iPhone app store until September. Homeplus has yet to get approval of the app from Apple. 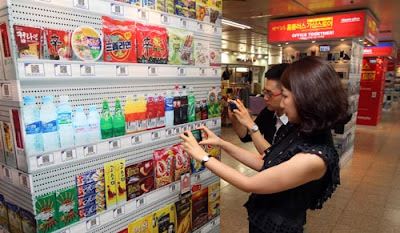 Seven pillars and six screen doors of Seolleung station have displays of 500 products with QR codes, the square scannable codes that are replacing the traditional barcodes. Lee said he has been searching for ways to link smartphones and Homeplus stores since 2008, when the number of smartphone users began to spike in Korea. According to statistics from the Korea Communications Commission, the number of smartphone users is expected to jump to 25 million in the second half of this year from 7.2 million in the first half. Citing research done last year by the Korea Interest Security Agency, Homeplus said smartphone users said they use their mobile phones the most on commutes in subways and buses.